Niobrara Evangelical Lutheran Church is a member of the Nebraska Synod of the Evangelical Lutheran Church in America (ELCA).Niobrara Lutheran's roots extend back to a time when a group of Norwegian immigrants settled west of Niobrara in 1890. 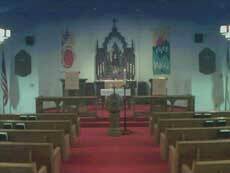 The first organized Lutheran Church was the Ponca Lutheran Church founded in 1891. This congregation survived until 1894 when the pastor left.On January 7, 1896, the Niobrara Norwegian Evangelical Lutheran Church was organized with a membership of 28. Church services were held in a schoolhouse until July, 1908, when a church building, located nine miles west of Niobrara, was dedicated. Services were conducted in the Norwegian language until 1918. Due to the unpopularity of foreign languages during World War I, services were held in both Norwegian and English from 1918 until 1927, with English becoming the language of choice after 1927. On September 15, 1946, the Norwegian Lutheran Church merged with the Bethany Lutheran Mission to form the Evangelical Lutheran Church of Niobrara and the Good Shepherd Lutheran Church in Lindy, Nebraska, formed one parish with one pastor.In 1977, with the town of Niobrara being moved to higher ground along with the Missouri River, the Niobrara Evangelical Lutheran Church constructed a new church that it now occupies. Currently Niobrara Evangelical Lutheran Church worships an average of 63 members and guests each Sunday. If you would happen to be visiting Niobrara or just passing through, please join us for Sunday worship. We would enjoy having you.